The supervision of all our surfing lessons is provided by professional holders of “Brevet D’Etat” 1st (athletic coach) and 2nd degree (teacher of athletic coaches) , and lifeguards. 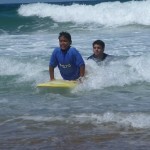 Fully weather-related , teaching surfing can be done in compliance with safety rules . We bring you on the best sand band depending on the weather and tide times . school softboards and Billabong wetsuits. To allow you to progress at your own pace, we organizing the surf lessons with different groups and different level .Starting from the first surf lesson until advanced surfers training. The age of each participant is also taken into account : Children from 7 years old , teens and adults. Our instructors adapt their teaching according to the different needs of each age group. 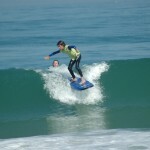 The surfing course are located on Labenne and Ondres beaches. Upon arrival at the Goandsurf chalet, you will find boxes available to deposit your staff, the meeting is set up 30 minutes before the begining of the lesson . Hours change daily, we follow the evolution of the low tide for surfing . Everybody handle a softop board and wear a Billabong wetsuit. All the group follow the instructor until the right location on the beach. The quality of our teaching is paramount and constantly evolving to adapt to the welfare of everyone. During the surf lessons , we will discuss various technical issues such as security, waves, technical aproach , knowledge of the environment , the importance of meteorology, history of surfing, priority rules and the preservation of our natural environment . During each session , our instructors will be with you in the water for helping and make you feel the pleasures of the surf . At the end of each 5 days stage , Goandsurf will give you a surfing passport in adequation with your level .